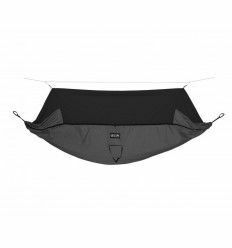 Side entrance zipper closure with strong #10 zipper and two double sliders. The Safari Deluxe Zip was developed for people who like really big hammocks. 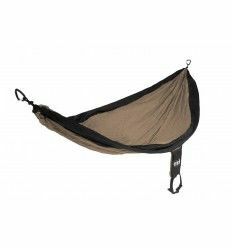 This is our deepest, widest and most comfortable hammock for larger people or even for cozy couples whose combined weight does not exceed 350 lbs / 160 kg. 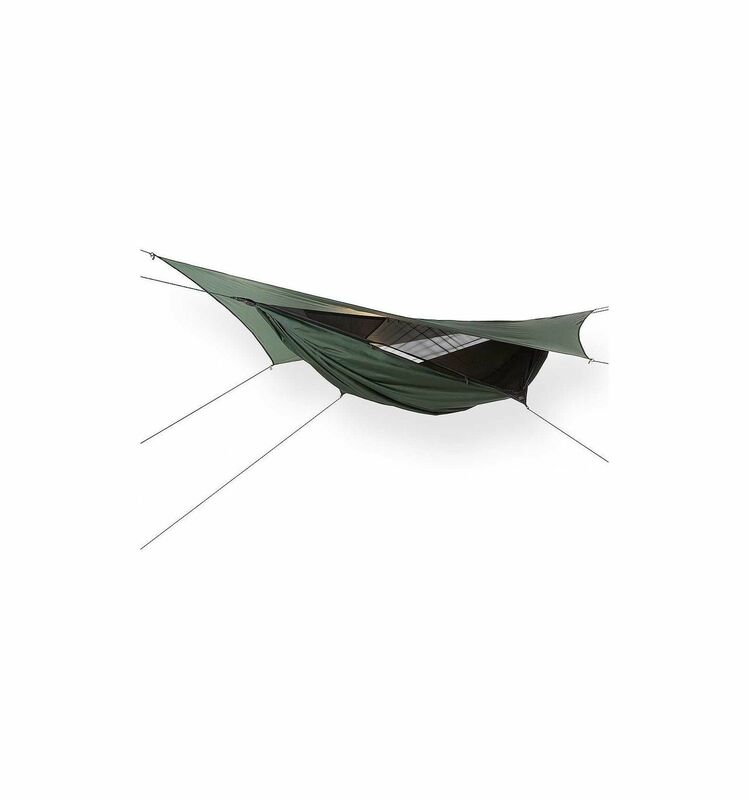 This model includes a a double wide hex shaped fly. 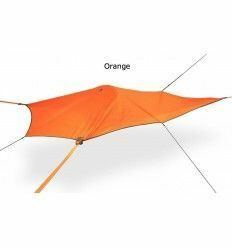 Ideal for hunting, car camping, boat camping, out at the cottage or in the back yard. 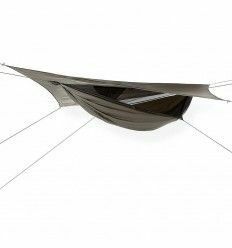 Extra SnakeSkins for Safari and Hex Fly: The Safari Models require one set of SnakeSkins for the Hex fly and one set for the hammock bottom if you intend to collapse both parts into SnakeSkins. 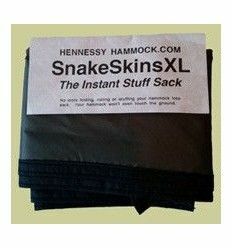 Many people use the SnakeSkins just to collapse the wet rainfly and keep it on the outside of their Pack. 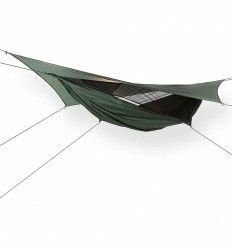 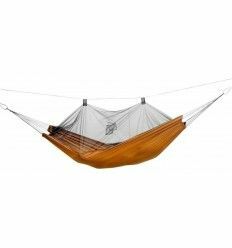 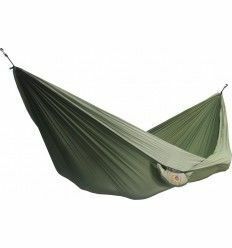 Height limit: 7' tall / 213 cm Weight limit: 350 lbs / 159 kg Packed Weight: 4 lbs 4 oz / 1927 g Packed Size: 5" x 8" x 12" Hammock fabric: 210 D oxford nylon Bottom Fabric Dimensions: 144" x 59" Mesh: 30D No-See-Um Suspending ropes: Two 10' long, 2700 lb. 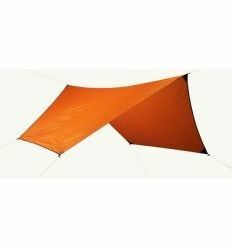 test polyester covered polyester ropes. 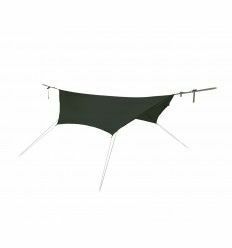 Webbing straps: 2" wide x 42" long polyester Rainfly weight: 24.7 oz / 700 g Rainfly fabric: 70D Polyeurethane coated Rip-stop polyester Rainfly dimensions: 12' on ridgeline, 10' wide Hex shaped Color: Forest green Stuff Sack: Logo and set up instructions printed on ripstop polyester bag (28 g / 1 oz) WHAT'S INCLUDED: All Hennessy Hammocks come complete with attached mosquito netting, detachable rain fly, support ropes, and stuff sack with set up instructions on back. 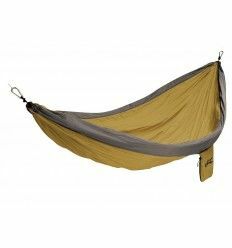 Hennessy Hammock also provides complimentary standard 42" long "Tree Hugger" webbing straps to protect the bark of trees. 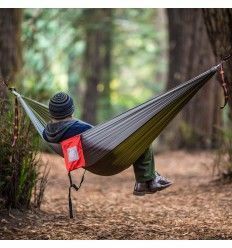 Because these accessory webbing straps are complimentary, they are weighed separately from the hammock.